Jacob Gong, an economics major, was among the first to earn the Ballard Scholar of Social Innovation recognition. Gong, along with students from a variety of other majors, including management, public health, and linguistics, recognized that the Ballard Scholar program had much to offer as he sought to apply his skill-set to social innovation. For Gong, becoming a Ballard Scholar was logical. 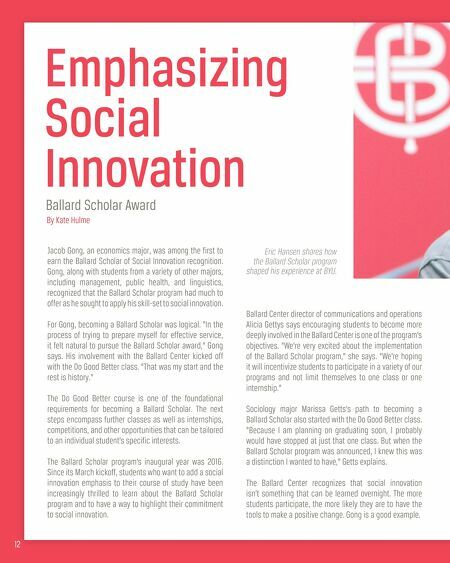 "In the process of trying to prepare myself for effective service, it felt natural to pursue the Ballard Scholar award," Gong says. His involvement with the Ballard Center kicked off with the Do Good Better class. "That was my start and the rest is history." 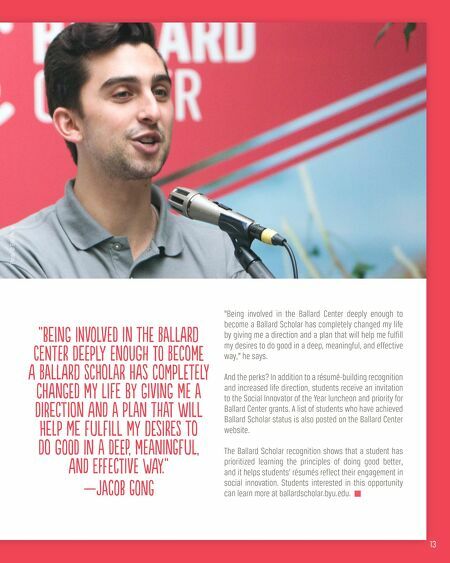 The Do Good Better course is one of the foundational requirements for becoming a Ballard Scholar. The next steps encompass further classes as well as internships, competitions, and other opportunities that can be tailored to an individual student's specific interests. The Ballard Scholar program's inaugural year was 2016. Since its March kickoff, students who want to add a social innovation emphasis to their course of study have been increasingly thrilled to learn about the Ballard Scholar program and to have a way to highlight their commitment to social innovation. Ballard Center director of communications and operations Alicia Gettys says encouraging students to become more deeply involved in the Ballard Center is one of the program's objectives. "We're very excited about the implementation of the Ballard Scholar program," she says. "We're hoping it will incentivize students to participate in a variety of our programs and not limit themselves to one class or one internship." Sociology major Marissa Getts's path to becoming a Ballard Scholar also started with the Do Good Better class. "Because I am planning on graduating soon, I probably would have stopped at just that one class. But when the Ballard Scholar program was announced, I knew this was a distinction I wanted to have," Getts explains. The Ballard Center recognizes that social innovation isn't something that can be learned overnight. The more students participate, the more likely they are to have the tools to make a positive change. Gong is a good example. Emphasizing Social Innovation Ballard Scholar Award By Kate Hulme 12 Eric Hansen shares how the Ballard Scholar program shaped his experience at BYU.